Wooden desks are all about having the perfect mix of form, function, and durability. There are many up-to-date materials for desk manufacturer. But you’ll agree with me that natural wood is still in popular demand. For thousands of years, it has been a staple for home decor and the trend doesn’t seem to end anytime soon. In short, wooden furniture has a timeless look that lends an air of prestige and beauty in your living space. Wooden desks come in many designs, sizes, and finishes. That means that it can be quite a challenge to select the best wooden desk that will fit your space. However, taking into consideration the amount of space you have, the durability of the type of wood used and the amount of storage space might help get your hands on the right wooden desk. Still finding it difficult to select the right desk? Well, let me make things much easier for you by presenting a list of the best wooden desks you can choose from. This is a solid wooden desk sporting a brushed maple finish. It has a spacious top to provide plenty of work surface. A grommet hole is integrated on the top to accommodate electrical cords; a feature that provides organized cable management. There are two drawers sporting safety stops. The drawers pull out easily, thanks to the smooth metallic runners. You get a slide-out shelf that accommodates your keyboard and mouse. A door storage compartment comes spacious enough to store a tower CPU. This desk comes dark but with some glossy look at the top. With plenty of surface at the top, you get a place to keep your monitor, laptop, and other items you desire to put on display. The top has a smooth feel resistant to scratches and spills. Two drawers are included on one side of the desk. The lower drawer is quite spacious and can hold European size hanging files. Runners make the drawers glide smoothly and you get safety stops so that the drawers don’t pull out completely. There’s a large cabinet behind the door; a perfect place to store a tower CPU. It has adjustable shelves to let you customize your storage space to your own liking. Top at the centre is a slide-out shelf for your mouse or keyboard. Why let the space on the corners of your room go wasted? This wooden desk is a perfect match for such locations. The desk has angular edges with L-shaped design on the side that fits into the corner of your room. The Pentagon top lends an air of sophistication in your room. This desk has the look and feels of solid wood. The top provides plenty of space and you get additional storage space provided by a shelf and drawer. 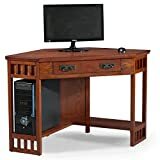 This wooden corner desk sports a lightweight construction for easy relocation from one room to another. It has a cherry finish; something that adds a natural beauty to its timeless design. This computer desk represents durability at its best. It’s made of oak wood, a solid construction that’s sure to last for many decades. The desk comes in an octagonal shape that transforms it into a perfect corner desk. The top is 1-inch thick and has a veneer finish for a smooth working surface. A wire grommet comes in handy for organized cable management. The desk has a pull-out drawer fitted with ball bearings to make every pulls smooth, quiet, and effortless. There’s a lower shelf designed to house a tower CPU or printer. To the untrained eyes, this might look like an ordinary wooden desk. Well, don’t make a mistake since this desk is built to last and take some beating. It’s fabricated from solid, engineered wood to provide a durability you can truly count on. The desk is designed to retain a natural wooden look that’s got an ashy look. 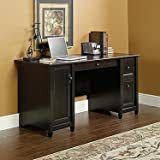 It has one storage drawer that pulls out to provide plenty of storage space for your small office essentials. Mission style side panels come in handy to add some drama and elegance to your space. This desk has lots of ground clearance for under-desk storage. It’s specially designed for residential use.